5 Ways to Affordably Improve Your Golf Course’s Playing Conditions – Overnight! 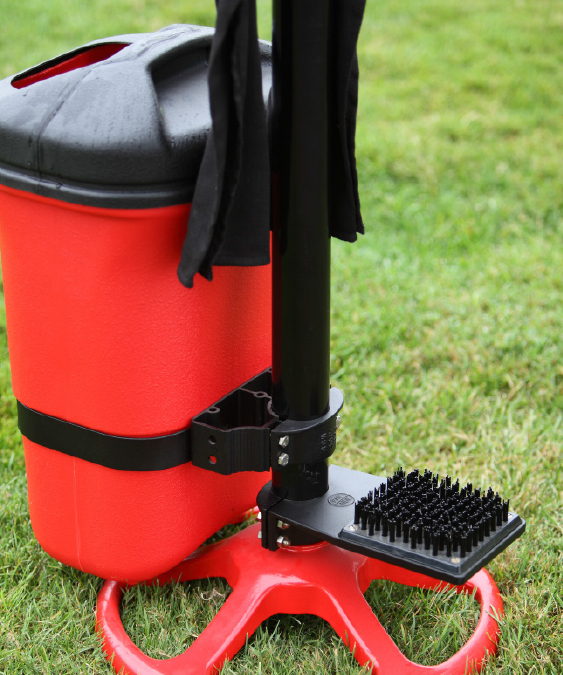 Golf course accessories play a vital role in any golf course’s playing conditions. They are seen and touched by golfers on every hole, they can create lasting impressions, they can reinforce your course’s reputation and they are the most affordable way to immediately improve course conditions. Unfortunately, when not maintained properly or replaced when worn, they can leave an unfavorable impression of your course as a whole. If you want to allocate your budget in the most strategic way, consider these 5 tips that your golfers will notice. These are the places where the impact accessories make is most immediate and works out to be the greatest in relation to your overall budget. 1.) On The Tee FOR LESS THAN $20 – Any of your worn spike brushes can be replaced throughout your course. 2.) 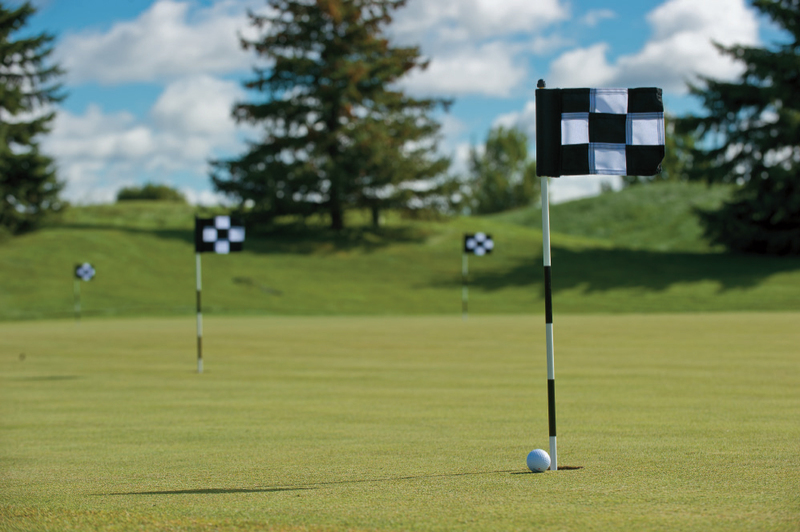 Practice Green FOR LESS THAN $250 – Makeover your practice green with all new Jr. Flagsticks, Jr. Flags and Practice Green Cups. 3.) 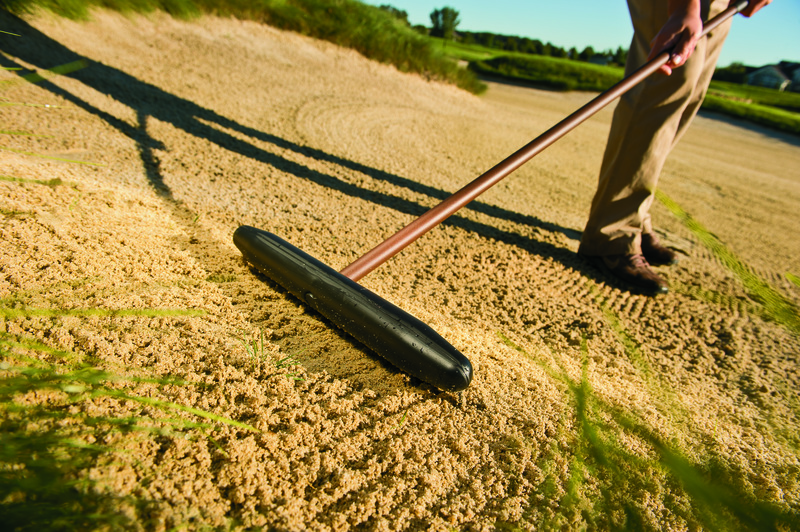 Bunkers FOR LESS THAN $500 – Replace your 25 oldest bunker rakes with new Accuform Ace II or AccuCurv Bunker Rakes. 4.) 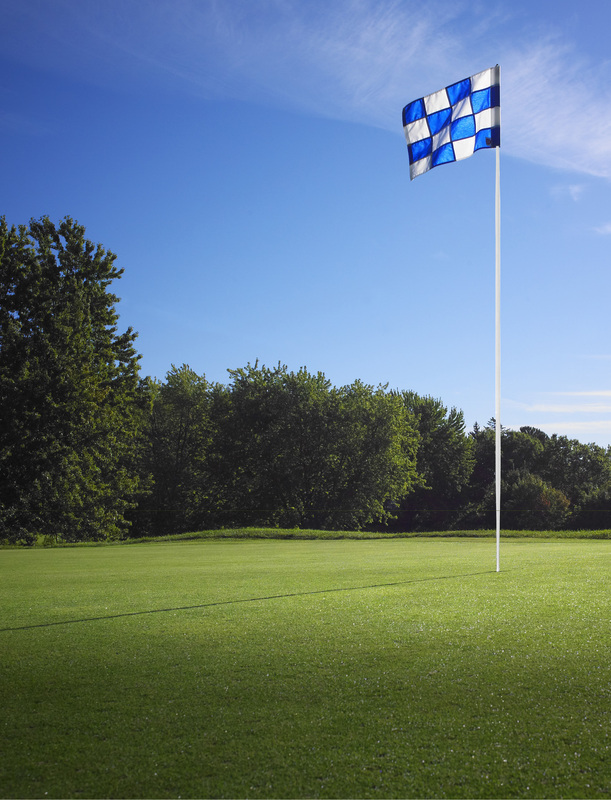 Greens FOR LESS THAN $700 – Freshen up the most touched and seen accessories on your course with 18 new regulation cups, flagsticks and flags. 5.) 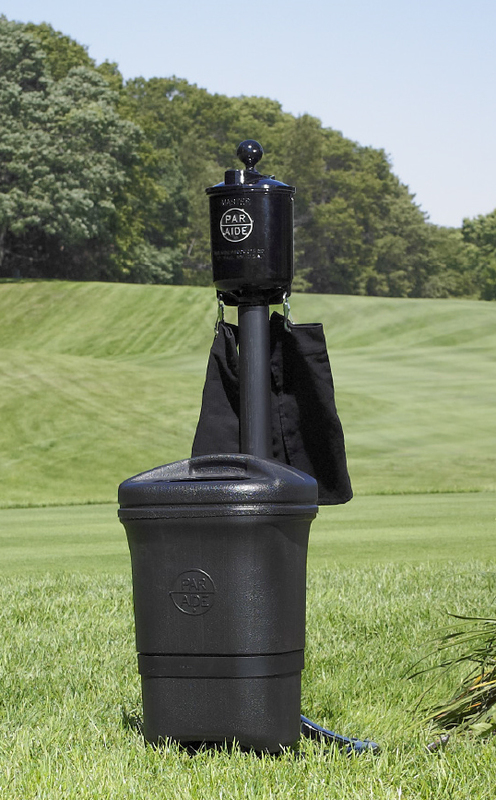 On The Tee FOR LESS THAN $1000 – Switch out 4-5 of your most worn ball washers with new Par Aide Master or Deluxe models. Home Brewing! It’s something every beer geek eventually wants to try, but once an assessment is made of all the equipment that is required, the sterilization needed, the time and energy involved, blah blah blah, it usually becomes easier just to BUY Bell’s Hopslam at the liquor store, rather than try to replicate it. As luck would have it, my sister-in-law and brother-in-law have ignored all these potential road blocks, and have all the necessary equipment to do a five gallon batch of home brew! 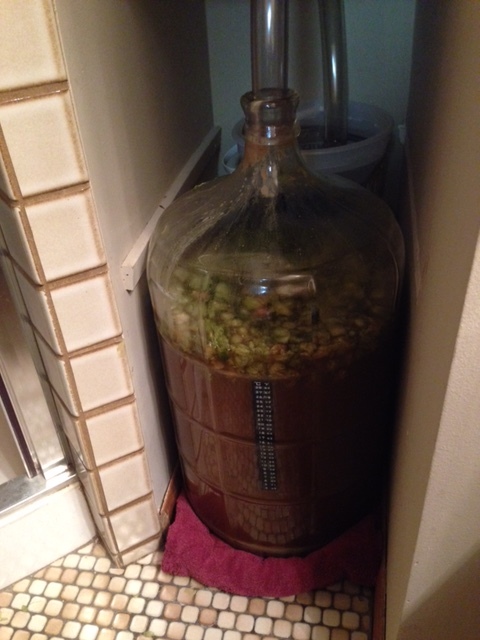 Our first attempt began in April 2014 with a kit purchased of West Coast Imperial IPA. While I generally love all types of beers, like most beer geeks these days, I definitely gravitate towards the IPA’s and Stouts. 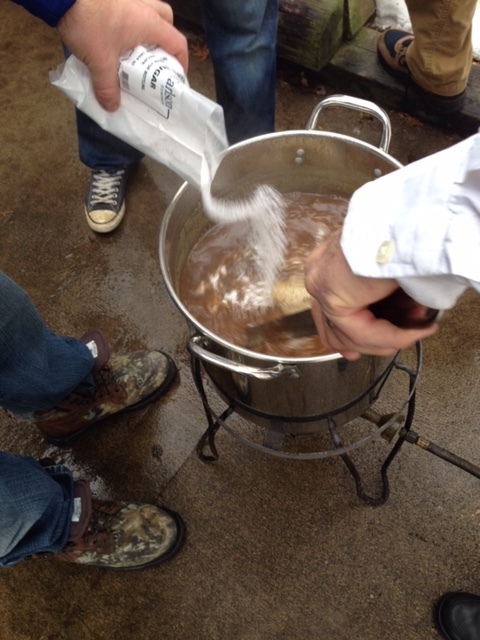 Our kit included a Briess Carmel malt base, with Summit and Cascade hops, and Danstar American West Coast Ale yeast. The brewing process was successfully done outside, during surprisingly decent weather for April in Minnesota. Next up was bottling in May. But what to call our debut beer? As if the beer naming gods were shining down on us during the process, while listening to our local sports radio station during bottling, an announcement had been made about a scratched horse from the Kentucky Derby – Hopportunity. PERFECT! And with that, Hopportunity Knocks was born! Yes, it came to our attention that Caldera Brewing Company in Oregon had already thought of our great beer name, but since these beers were only for personal consumption and not sale, we stuck with it! Now we needed a “brewery” name. Since my brother-in-laws and sister-in-law were all involved in the brewing process, and two of their first names conveniently start with vowels, we unofficially formed S.T.E.A.D. Brewing Co. (Steve, Trevor, Ernie, Annie, Dave). After another month of PATIENTLY waiting, the first sample exceeded all our expectations and actually tasted like an IPA I would buy. Samples to friends and family yielded similar results – maybe we were on to something?! So, we decided to try again this fall, with the same West Coast IPA kit. 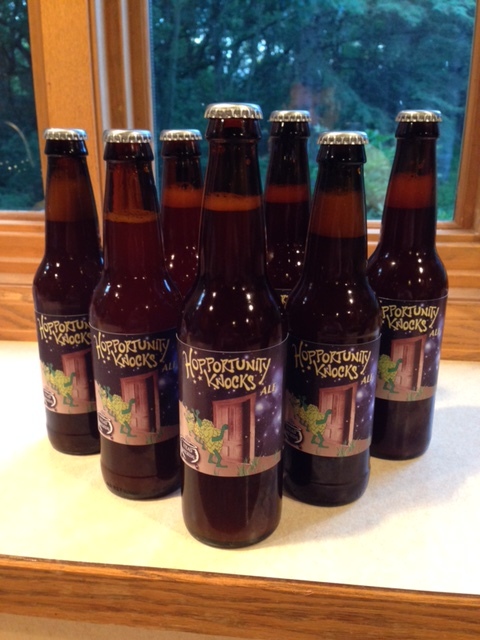 However, this time, we were able to procure some fresh whole leaf Centennial hops. 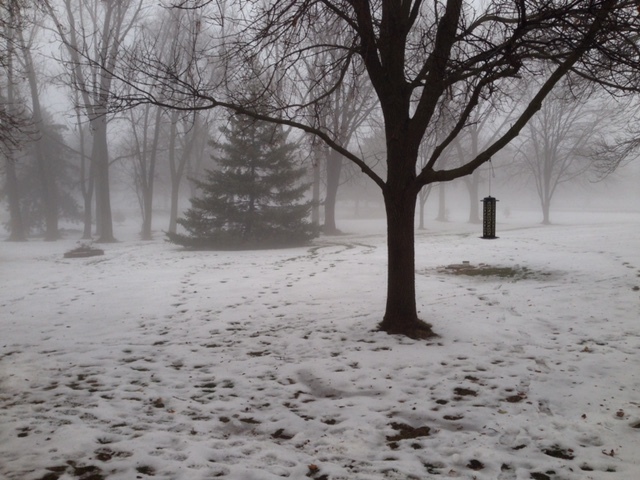 On a foggy November Sunday morning, again with unusually warmer weather for a November in Minnesota, during the second match up of the season for the Vikings and Packers, we brewed again outside . 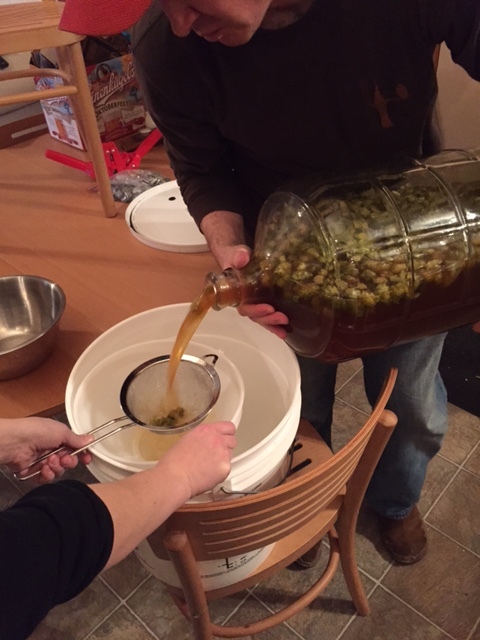 This time, with a nice “dry hop” addition of the Centennial hops added right before fermentation was to begin. Two weeks later, we added another dry hop addition, and to start the New Year out right, bottling of “Foghop” took place on January 3rd. 39 wonderful 12 ounce bottles were yielded. Stay tuned for the first sample in mid-February! Next up, the St. Paul Winter Carnival Beer Dabbler. An event at the Minnesota State Fairgrounds midway area where 150 breweries show off their latest selections! Last year’s event saw 7,000 people sampling beers in -20 degree weather! Other than many keg lines freezing, the event was a great success and I can’t wait to return this weekend. I’m Dave Leach and I am the Operations Manager at Par Aide Products Company. Golf and fine adult beverages have had a long and storied association. So, with what I hope will be at least a shred of credibility and non-bandwagon jumping, I present to you LEACH’S LIBATIONS – a semi-frequent blog that intends to discuss all things craft beer. Specifically, national breweries that I’m very fond of, the best local breweries our Twin Cities has to offer, experiments with home brewing (which I will be sharing with you soon), and other craft beer-related events. There won’t be many fancy abbreviations and other beer geekdom terms thrown around here – mostly just thoughts shared on great beer and great beer events! This post is by Par Aide’s Engineer – Randy Paulson. When he is not developing or fine tuning our products he spends time as a photography enthusiast. His photographs have also been used in the Par Aide and Miltona catalogs. Below he shares just some of the nearly 3,000 fantastic photos he took on a recent road trip. Click on the pictures to enlarge, Enjoy! It started out as a much less ambitious trip. It ended as a 4,000 mile, seven state, 78 hours behind the windshield tour through 12 National Parks and Monuments over eight short days in September. 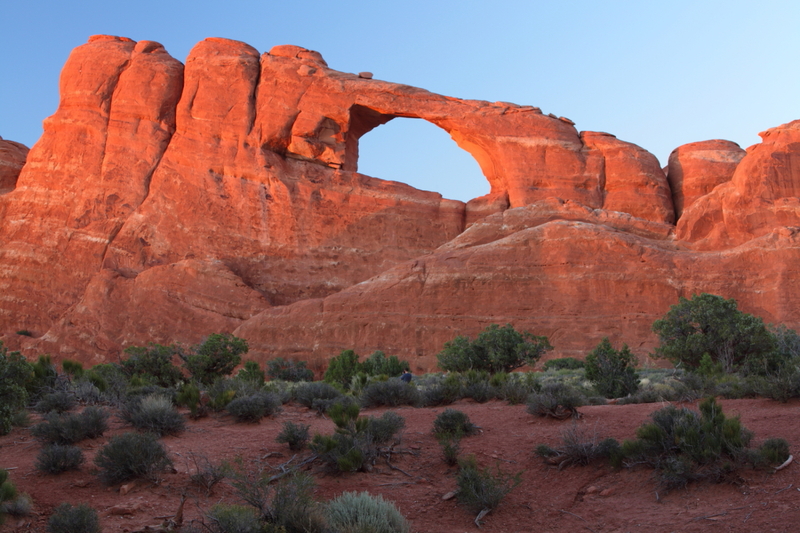 My original idea was to visit Arches National Park in Utah with photography as the sole objective. I was willing to do the trip alone, but I realized how much more fun it would be to have someone along who shared the passion. Enter my good friend Doug. We met in 1985 as employees at Apple Computer in Garden Grove, CA. We’ve been best of friends ever since. Fortunately, he has a supportive wife who really pushed him to join me. We left Minneapolis on a Friday in September, intentionally after Labor Day to minimize the family vacation crowd. 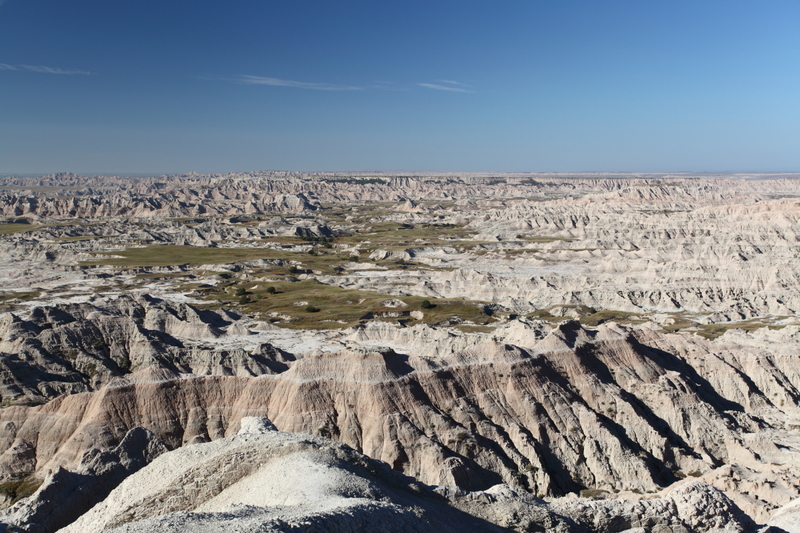 Our first stop was Badlands National Park in South Dakota. We camped there, got up early for some sunrise shots and had breakfast at the famous Wall Drug in Wall, SD. By late Saturday afternoon we were in Rocky Mountain National Park outside of Boulder, CO. Our intention was to camp there, but the park was packed, so we continued on to Grand Junction to find a motel. It was poor planning on our part as there was a wine festival that weekend and there were no rooms available. We pushed on to Green River where we encountered Mellon Days and you guessed it, no rooms. The remainder of that short night was spent sleeping in the car in the back lot of the Ramada Inn. 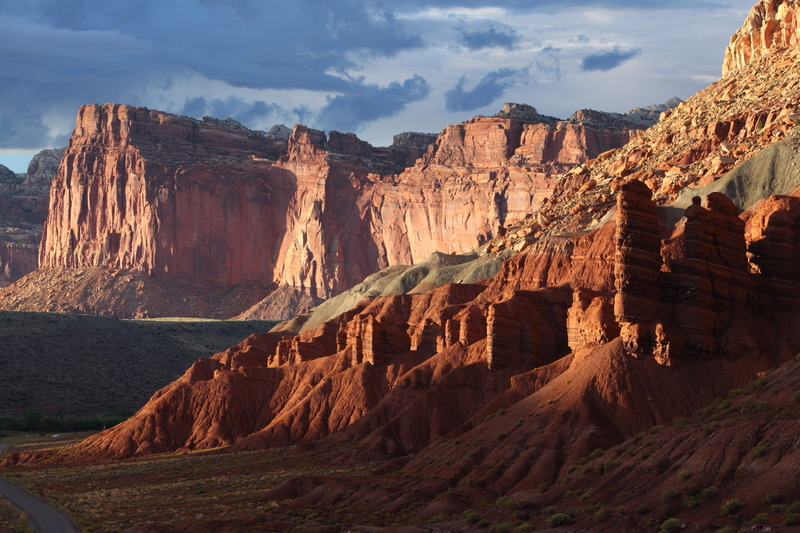 Daylight put us back on the road early headed for Capitol Reef National Park in Utah. We arrived early in the afternoon, set up camp and were able to climb up a nice trail to higher elevation for some shots. That evening we were able to get some more nice photos in the waning light before sunset. Early Monday we struck out for Staircase-Escalante National Monument, not far south of Capitol Reef. 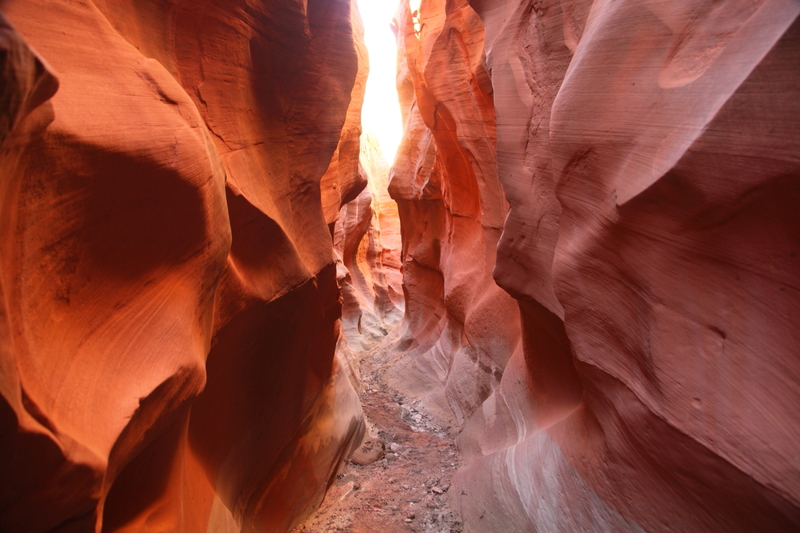 Upon our arrival at the visitor’s center, we asked one of the park rangers about slot canyons. He gave us directions that finished with the statement “the road’s not too good”. I guess two and a half hours to drive 26 miles supports that statement. 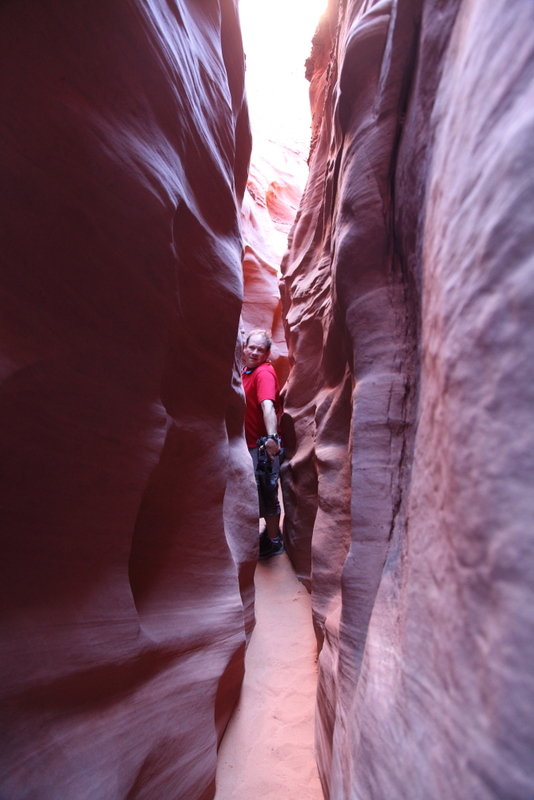 However, the reward was far greater than the punishment as the slot canyons were fantastic! It was dark and we were tired by the time we got back to civilization, so we stayed in a motel that night. 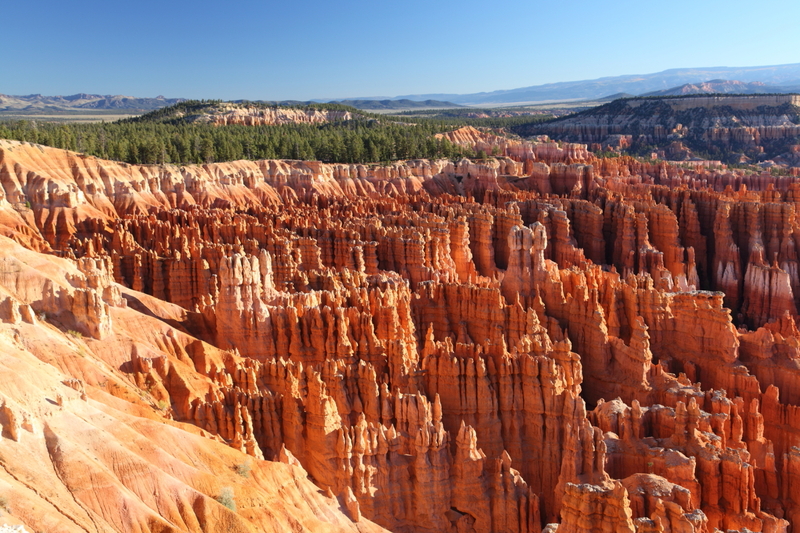 Tuesday we headed for Bryce Canyon National Park. I’d never been there and could not recall seeing any photos. I was awestruck! Doug and I buzzed through the canyon, stopping at all of the overlooks and vistas all the while filling flash cards with images that don’t begin to do justice to the beauty of Bryce Canyon. After a nice buffet lunch, we headed south to Zion National Park. The main campgrounds were full, but we were able to get a site in the overflow area. All transportation within the canyon is by shuttle bus, so after setting up camp we headed out to catch the shuttle. Photography is difficult (at best) in Zion, especially with our self-imposed time restrictions. Most of the features are so large and so close to the view areas that it’s impossible to get representative shots that are properly lighted. 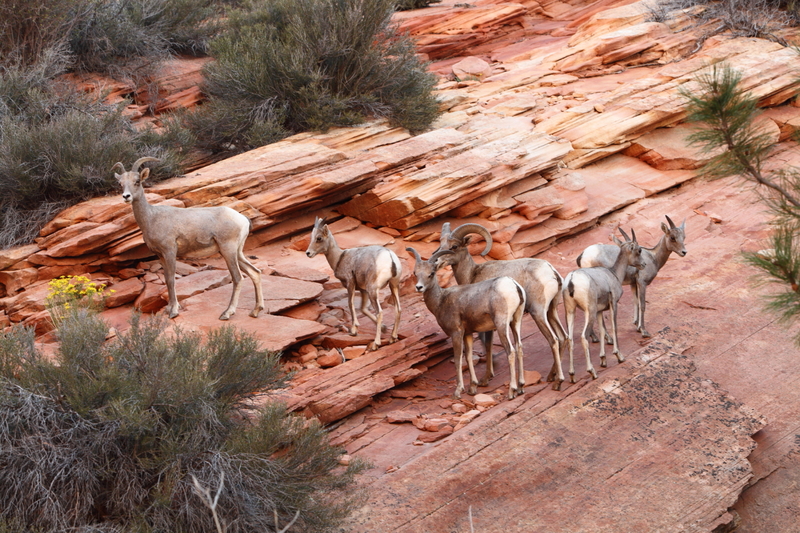 On the way into the park we had seen a herd of Big Horn Sheep. After getting back to camp, we loaded our gear into the car and headed back toward the entrance in search of sheep. We got lucky and stumbled onto them late in the afternoon. The herd was about 12 or 14 strong and VERY used to being around people. 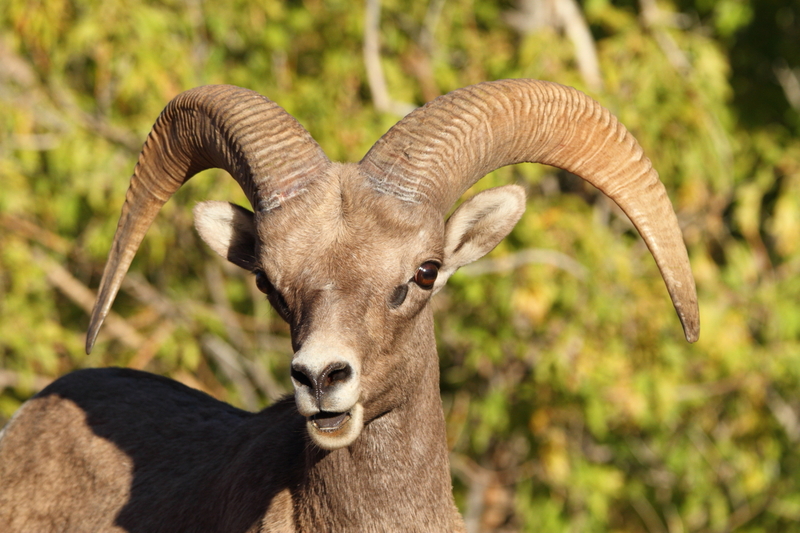 Big Horn portraits were taken until the sun went down. The sheep photos are my favorite shots of the trip. As the sun came up Wednesday morning, we were already well south of Zion, headed toward Mesa Verde National Park in Colorado. By late in the morning we came upon an exit to Wahweap Marina on Lake Powell in Glen Canyon National Recreation Area. I’d done a boat shore camping trip from Wahweap back in the ‘80’s so I was familiar with the beauty of the rock formations and the lake. Our unplanned stop there was one of the unexpected jewels of the trip. We’ll probably plan a houseboat trip in the future as a result of that short stop. An hour or so later, we passed by Monument Valley where many of the old westerns were filmed, but we decided not to stop. However, Four Corners National Monument snagged us. I’d not been there and am pleased that we stopped to snap a shot or two. 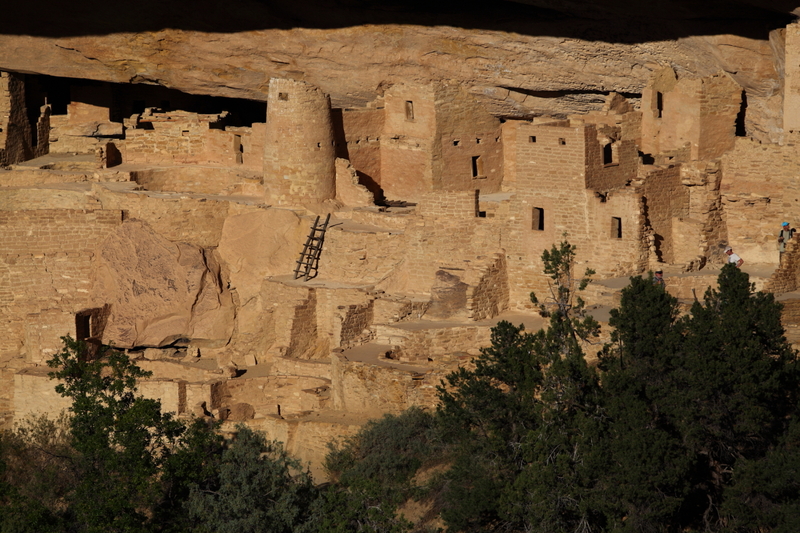 With the golden hour approaching, we pulled into Mesa Verde. After checking out the map of the cliff dwelling sites, a quick plan was formulated that would take advantage of the ever improving light. We were able to visit most of the sites twice, once on the way in and once on the way out, and ended up with just enough time to hike down to the one site that can be easily reached by trail. Of all of the parks we visited, Mesa Verde has the BEST facilities. The campground is huge, there’s a GREAT general store (with Wi-Fi), but best of all, they have a laundry and shower facility. Unfortunately, one of my chargers with a Canon battery is still plugged into the wall in the laundry room. Pre-dawn darkness Thursday morning found us on the road headed north toward Canyonlands National Park. About halfway to the park entrance we came upon a sign advertising an overlook onto the canyon. It was about 20 miles off of the highway so we hesitated, but ultimately made the trek. Wow! That 20 mile drive resulted in one of the most fantastic views that I’ve experienced. 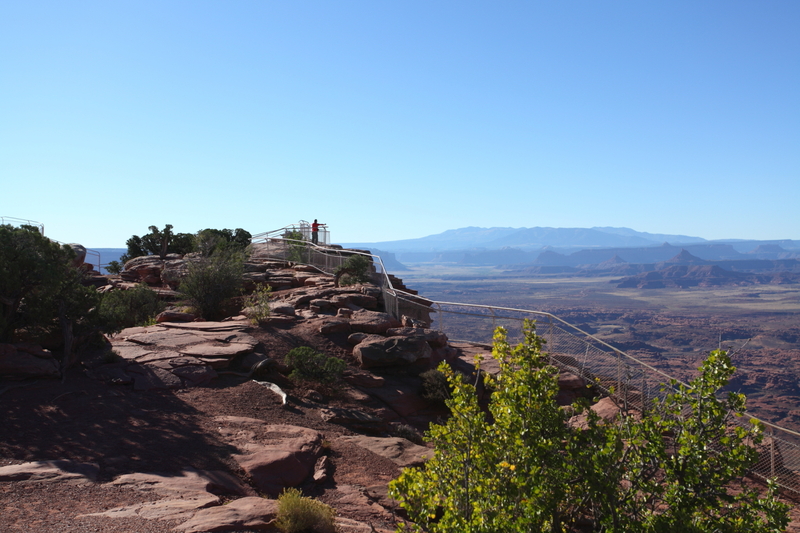 In fact, the magnificence of that view exceeds that of the view from the actual park. 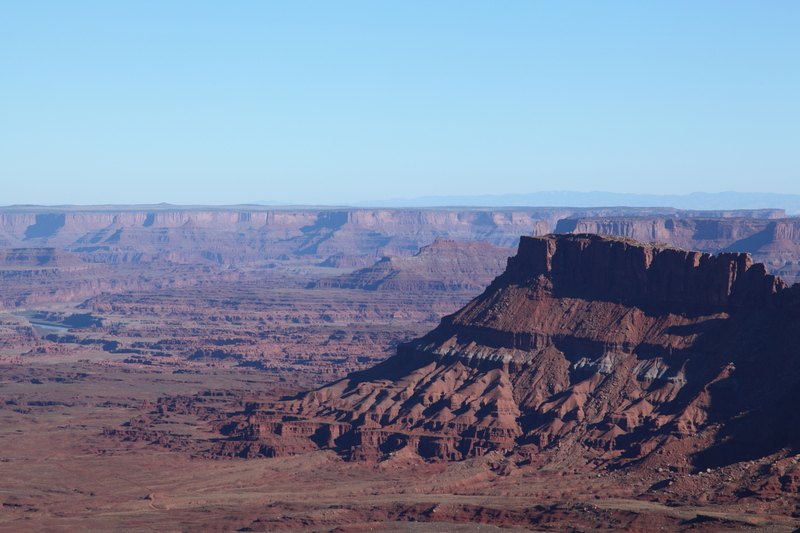 Our stay in Canyonlands was brief. Arches National Park is just a short drive up the highway near Moab, UT. Of course there were no available campsites in Arches so we found a campground on the river just outside of the park. We set up camp and headed back to Arches for more photo ops. One of the shots on our list was Delicate Arch at sunset. After arriving at the Delicate Arch parking lot two hours before sunset to find it full with more cars circling in search of spots, we decided to lower our sights and target a less popular arch. As it turned out, we found a great place to set up our gear and have a cold one while we waited for the sun to set. By now we were pretty good at breaking camp in the dark without making too much noise. 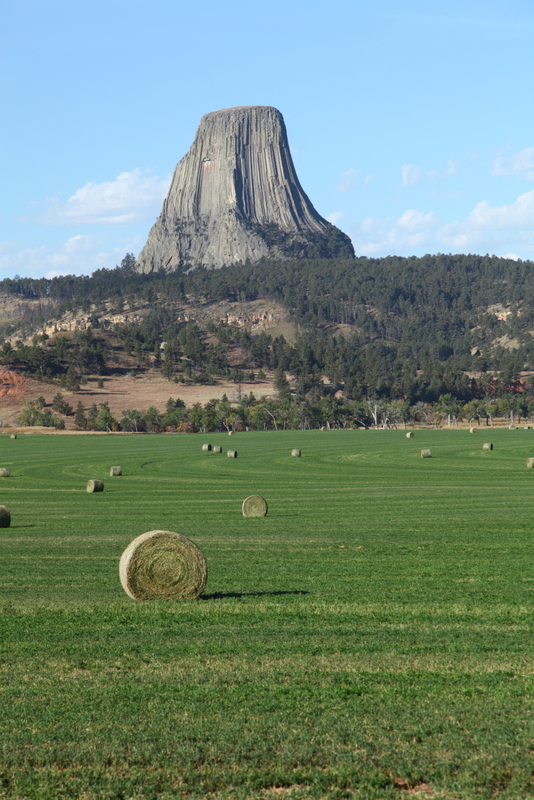 Our drive to Devil’s Tower National Monument took us through Grand Junction, CO again. 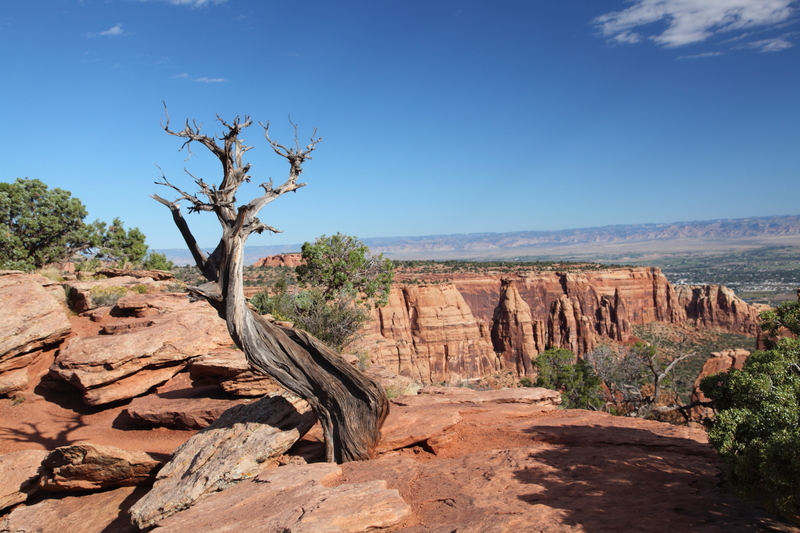 Having attended college there decades ago, I was familiar with the Colorado National Monument. The road through the monument is a beautiful loop that can be entered from the west end at Fruita and exited on the east side in Grand Junction. That turned out to be another unplanned jewel. Friday was a long day in the car, as we pulled into Gillette, WY after dark. As tired as we were, we found a motel and then headed out in search of pizza and beer. A good night’s sleep later we were aimed at our last destination, Devil’s Tower. We arrived in the park and were set up to shoot when the sun finally illuminated the tower. Immediately adjacent to the park road is a prairie dog colony. 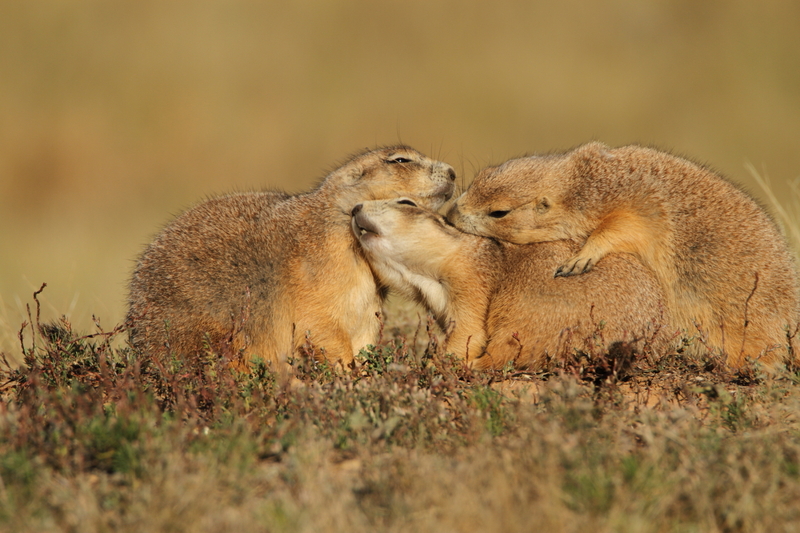 We both switched lenses and spent the next hour shooting photos of prairie dogs. 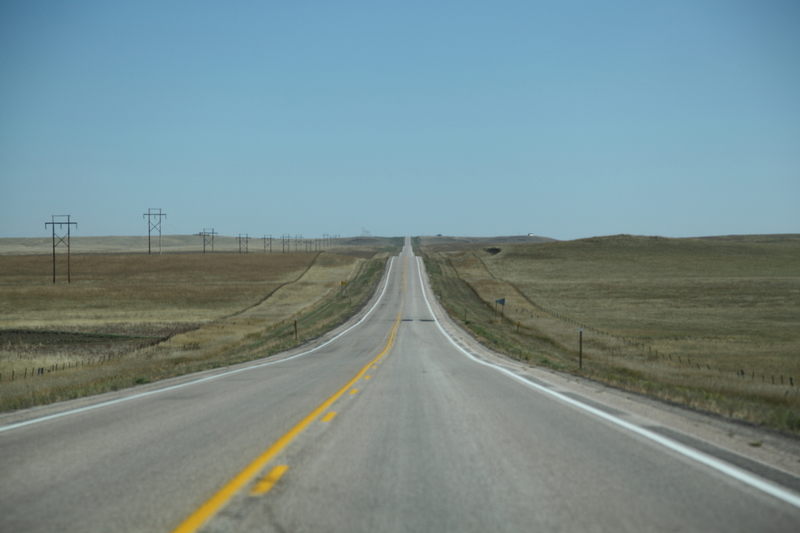 Rather than head straight south all the way back down to I-90, we opted to catch Hwy 212 and take it back through South Dakota into Minnesota and nearly to Doug’s back door. In hindsight, it was a great decision, as we experienced a peaceful, traffic free drive home. Our 4000 mile trip was an adventure. One could spend weeks at each of the 12 parks and still not fully capture the beauty. We had time to only scratch the surface. Would we do it again? Absolutely. We’re already talking about a follow-up trip. I’d like to take this opportunity to address some questions and what we believe some possible confusion surrounding the 15″ Cup initiative. First let me address some history and how we (Par Aide) are involved. The 15″ Cup was the brainchild of Taylor Made and came to life via a project they are calling “Hack Golf”. This is a project designed around growing the game of golf. Hack Golf is an open forum for people to comment and give thoughts/ideas on ways to grow the game…that has been steadily declining. Golf is losing golfers, rounds are down, revenue is down to facilities and courses are closing and are projected to continue to close in the US at a staggering rate over the next 10 years. We need to look outside the box and think of different ways to grow the game and this idea is just one of them. 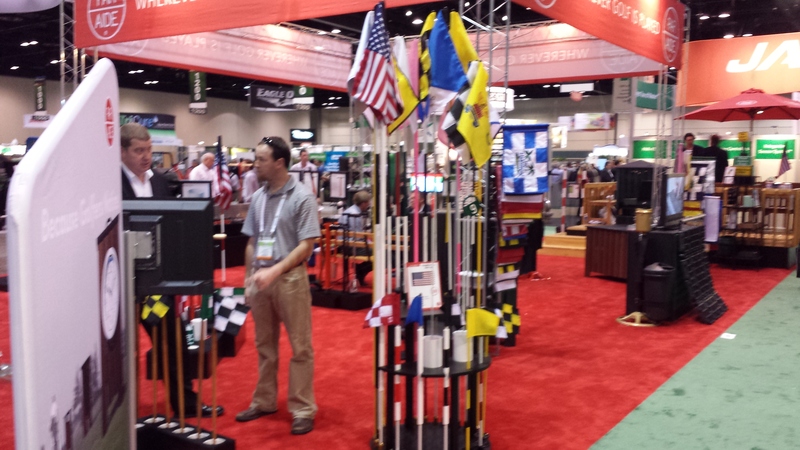 Taylor Made announced their investment in this project at the 2014 PGA Show and approached Par Aide to partner with them in production of the cup, hole cutter, flag sticks, flags and tee markers. A kick off event was held at Reynolds Plantation on the Monday after The Masters where sports writers from across the country were introduced to the 15″ Cup idea. Since then, many articles have been written about that event and the 15″ Cup. This is where we see some of the confusion happening as many of these commentaries have missed the mark. The 15″ Cup is NOT designed to replace a regulation cup. It is not meant to be used in normal everyday play for an avid golfer. It is not something anyone is trying to promote to change the integrity of the game. It is meant to be just one more idea to attract beginners, kids, etc to the game. Its hard to argue that the game of golf, that we are all deeply invested in, needs to find ways to grow. Attract new golfers. Increase rounds. Increase revenue. Again, In no way, shape or form is the 15″ cup meant to replace a regulation cup, rather, the thought is that it could be used in conjunction with a regulation cup to offer beginners a different target to putt to. Think of it like tee ball for baseball. Lowering the rim and using a smaller ball for basketball. Bumpers for bowling. Or any other sport that makes modifications to attract beginners and make the game easier and less intimidating for them. Other than shorter clubs and Jr. Tees, golf is not doing much to make an extremely difficult game easier, less intimidating and more inviting for say a 6 year old. Will the 15″ Cup be for every club? Of course not. And Mark King, CEO of Taylor Made, who has committed $5 million to growing the game of golf readily admits this. But to his credit, he is doing something about it whether it works or not. Does the 15″ Cup come without a number of maintenance issues for Golf Course Superintendents? No, obviously. That is where we come in and why Taylor Made chose to partner with us. We are doing everything we can to make the process as easy as possible for our customers. We are looking at different ways to cut the cup, mowing practice when the cup is in play, designs in the actual playability of the cup, etc. While this idea doesn’t come without its fair share of “issues” we hope our customers as well as the golfing community can understand what the true goal of this project is. To grow the game of golf and preserve its future. Another “show” come and gone, number 41 for me (first one in 1971, missed two since). Nothing much changes; set up, long hours on one’s feet, tear down. And, contrary to what my friends think, it is not all fun and games. In fact, might be the hardest work of the year between stress in what might come up or be seen and being “on” for two days and three nights. My purpose here is to try to stimulate some thought based on some things I heard and some thoughts I have had for some time. The times are certainly a changing or maybe just continuing on a course that is found in almost all industries; less and less interest in trade shows. While attendance was supposedly up, it sure seemed down to us though not by a lot. 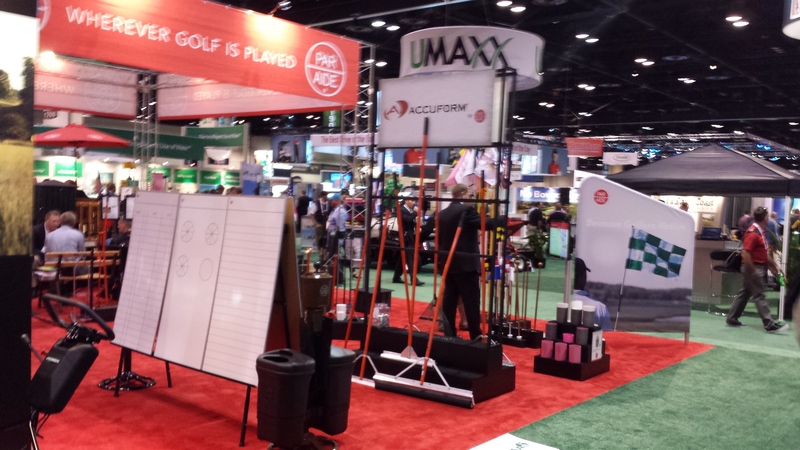 And clearly, while the GCSAA claims to have sold more square feet than last year, it is not hard to see that the scope of the show is considerably less than in days gone by. More than one person remarked how they could easily see from one end of the hall to the other. So what is the cause? Surely the golf economy has affected budgets. Superintendents are more reluctant to leave their courses. He/she has the ability to get answers to turf questions and/or the latest information and/or reviews of various products are readily available over the internet. Many manufacturers do not save their new product introductions for the show as in past years. Now, new products are introduced as soon as ready. And, maybe most alarmingly, the CGCS designation is seemingly losing a little bit of its importance as the general hiring doesn’t put the value in it. This is a shame and if true, minimizes the value of the education which has always been such a big draw. Obviously, from a manufacturer’s viewpoint, fewer customers affect its willingness to spend more and more money on the show. I believe that Par Aide’s booth space (just the concrete we rent for our booth) was around $36,000. Add to that the cost of carpet, shipping, time lost in production and sales, hotel rooms, airfares, entertainment, and etc, and one cannot help but question the costs vs value. However, for Par Aide, the GIS is truly an international sales meeting and that combined with seeing the customers/friends and supporting the industry makes it hard for us to not participate as we do. However, here is a suggestion that is not new and maybe worth reconsidering. Should the GIS be held every 18 months? My thinking is that this might make attendance more palatable to owners and greens committees. It might become a more special event to not be missed. Manufacturers would probably be willing to pay more (we have talked even double for booth space) as ½ of all the other above mentioned expenses would be halved over two years. I have to think that distributors would see the same savings. Perhaps more importantly, the show could then move around the Country to northern cities when the dates fell in the Spring thru Fall months. The required show square footage has now dropped to a level where smaller show halls around the Country could easily accommodate us, which was not the case a number of years ago. I have to believe that the same three locations alternating does reduce some participation. And, the golf tournament might have far more flexibility in nearby locales. Many years ago, there was a publication that was feared would try to develop a show on the off years when the GCSAA was being urged to consider an every other year event. Obviously, that was not going to be accommodated. That risk doesn’t really exist now and 18 months would not allow for it anyway. So anyway, is it time to reconsider? Obviously, I am not privy to discussions within the GCSSA on this subject and there could be numerous reasons it doesn’t work. Additionally, the decision must be influenced by the big companies which carry the show on its back. Any thoughts out there? Especially from Superintendents. After all, you are why we exist. It’s not that I went away, it’s just that I got lazy. So here is a way delayed blog that is important reading for you, if over 50 years old, or for any golfers you know who are over 50! These new rules are long overdue! A ball sliced or hooked into the rough shall be lifted and placed on the fairway at a point equal to the distance it carried or rolled into the rough with no penalty. The senior should not be penalized for tall grass which ground keepers failed to mow. A ball hitting a tree shall be deemed not to have hit the tree. This is simply bad luck and luck has no place in a scientific game. The senior player must estimate the distance the ball would have travelled if it had not hit the tree and play the ball from there. There shall be no such thing as a lost ball. The missing ball is on or near the course and will eventually be found and pocketed by someone else, making it a stolen ball. The player is not to compound the felony by charging himself or herself with a penalty. If a putt passes over a hole without dropping, it is deemed to have dropped. The law of gravity supersedes the Rules of Golf. Putts that stop close enough to the cup that they could be blown in, may be blown in. This does not apply to balls more than three inches from the hole. No one wants to make a travesty of the game. There is no penalty for so-called “out of bounds.” If penny-pinching golf course owners bought sufficient land, this would not occur. The senior golfer deserves an apology, not a penalty. There is no penalty for a ball in a water hazard, golf balls should float. Senior golfers should not be penalized for manufacturers’ shortcomings. Advertisements claim that golf scores can be improved by purchasing new golf equipment. Since this is financially impractical for many senior golfers, one-half stroke per hole may be subtracted for using old equipment. Please advise all your senior friends of these important rule changes. NOTE: these rules only apply for the over 50’s.